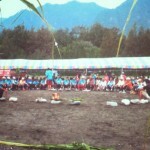 Paterongan (or Xinshe/新社 in Chinese) is located along the picturesque coast of southern Hualien County. 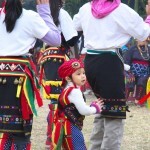 Its population is mostly Amis, but also includes the largest concentration of Kavalan (or Kbalan in Kavalan language) in Taiwan. 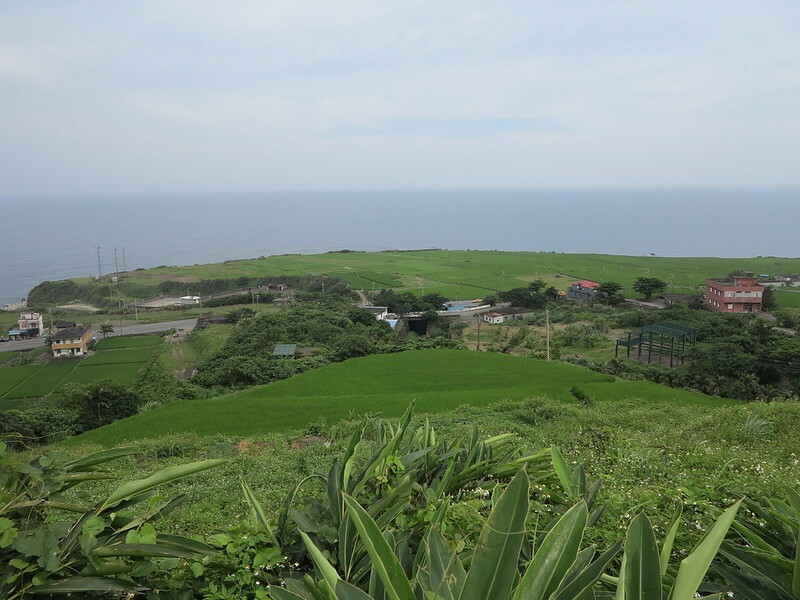 The Kavalan once inhabited the plains of Yilan County in northeastern Taiwan but were forced to leave there some 250 years ago due to clashes with Qing dynasty troops and other indigenous peoples. Most landed on the beaches of Xinshe, naming it Paterongan in their language, which means “a place to rest and live well”. Qing-Shui Pan (潘清水), a guide for the Paterongan Flying Fish Association, which is devoted to preserving and promoting the Kavalan culture in Paterongan, noted that as the Kavalan have always lived off the sea, thus being near the ocean was one of the essential factors in deciding on a new home. 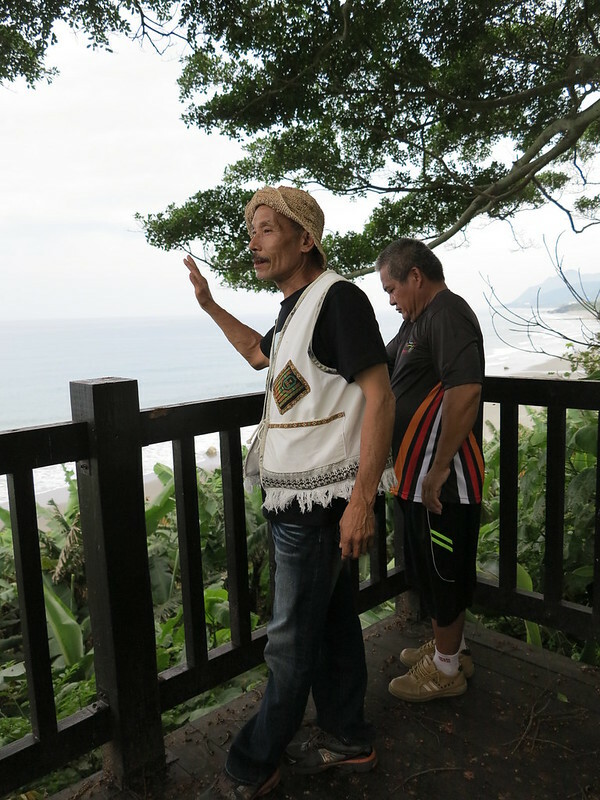 They made use of their traditional knowledge in boat making and navigation and headed southward to Hualien and Taitung counties following the coastline. Most landed on the beaches of Xinshe, naming it Paterongan in their language, which means “a place to rest and live well”. Pan showed me the landing site and explained that for a long time it was a makeshift harbor. Goods that could float were placed into the water and the Kavalan people would swim out to retrieve them. Those goods that could not float were placed onto bamboo rafts. Qing-Shui Pan introduces the site where the Kavalan arrived 250 years ago and which they named Paterongan. ……She began to learn this art form eight years ago when she was well into her sixties. However, she remembers her mother using banana fibers to weave cloth. A unique characteristic of the Kavalan tribe is the use of banana fibers to weave cloth. 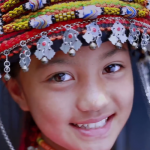 Most of Taiwan’s indigenous tribes used ramie, a type of Asian hemp, to produce clothing. 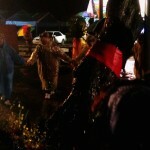 However, the Kavalan found that banana plants are easier to grow and the fibers are softer. In 2003, the Lalaban Xinshe Banana Fiber Workshop was established to revive this traditional art form. Today, it employs about a dozen women. The clothing, coin purses, handbags and other products are entirely handmade from the harvesting of the banana plants to the processing and separation of the banana fibers and spinning of the fibers to prepare them for weaving. 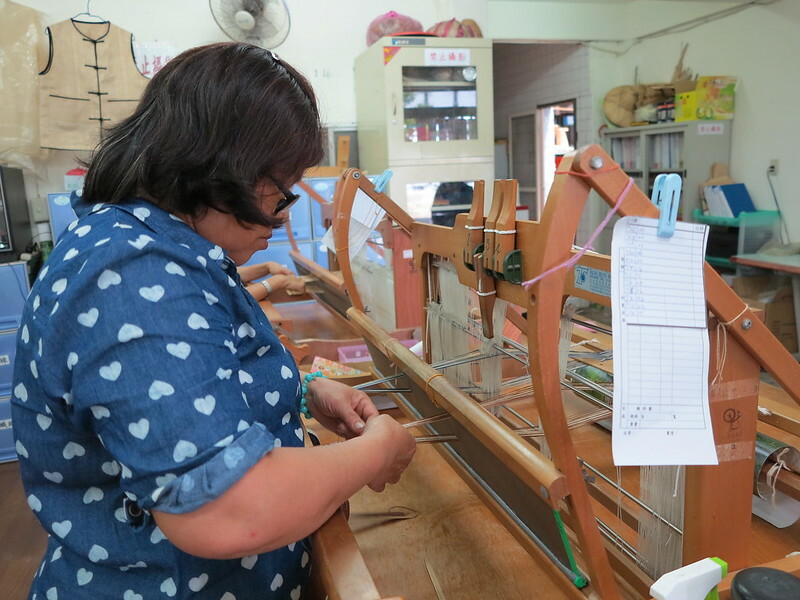 Mama Jie (階媽媽), considered a national treasure for the quality of her weaving, says that she began to learn this art form eight years ago when she was well into her sixties. 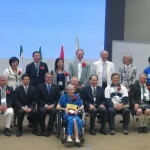 However, she remembers her mother using banana fibers to weave cloth. Yu-Ying Yan (嚴玉英), who is also a weaver, says that the patterns she and the other women produce are based on those of Kavalan formal wedding attire. In this village reside two elderly Kavalan men who carry out rattan weaving. Although neither was available to interview the day that I visited, I was able to see their works displayed at the local grocery store. These included hats, baskets and bags. Traditionally, cloth weaving was considered women’s work and rattan weaving men’s work. Although there are young women living in the village interested in learning traditional weaving techniques and patterns, the same is not true for rattan weaving. Collecting and preparing the rattan and weaving objects are very time consuming and thus have not appealed to the younger generations. Thus, it is feared that this traditional art form may soon disappear. Weaving traditional motifs on manual loom. 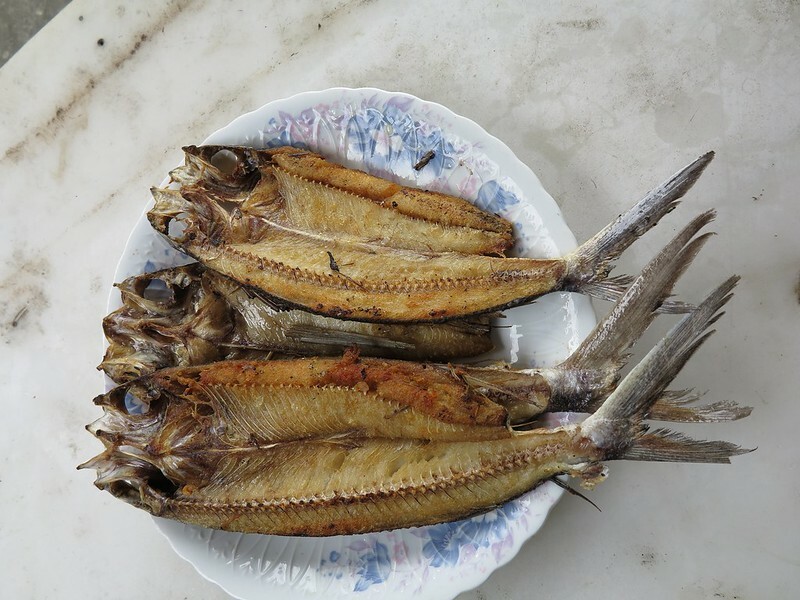 Many of the families carry out fishing and thus a typical meal can consist of fish, shellfish, and perhaps crab or lobster. Our next stop is the Sea Princess Guesthouse, which was opened in 2013 by a local Amis woman, Shu-Hui Yang (楊淑惠), and her daughter. It is the only indigenous owned guesthouse in the community and offers elegantly decorated rooms with gorgeous views of the ocean. Yang notes that her guesthouse provides cultural performances and meals of indigenous cuisine to groups of about 20 that rent out the entire building. In addition, she works closely with the Paterongan Flying Fish Association to ensure her guests an unforgettable cultural and ecotourism experience. Pan notes that one of the best ways to experience Kavalan culture is to stay overnight with a local family, which the association can arrange. Many of the families carry out fishing and thus a typical meal can consist of fish, shellfish, and perhaps crab or lobster. The Kavalan also have a vast knowledge of edible plants and any number of wild greens may be included. The food is accompanied by locally grown rice and a tour of the community is sure to include the coastal rice paddy terraces. These terraces were created by the early Kavalan settlers. On the adjacent hillsides are rice paddies which have received organic certification. These lie in the shadow of Lalaban Mountain. This is considered the sacred mountain of the Kavalan, as it is a natural lighthouse. Even when fog and dark of night hide the surrounding peaks, Lalaban Mountain remains visible, allowing fishing boats to find their way home. Rice terraces are one of the unique characteristics of the Kavalan, as most indigenous tribes grew millet as their staple grain. Pan notes that the Kavalan of Paterongan are careful to preserve their stories, culture and way of life. They are currently working with the East Coast National Scenic Area Administration to develop sustainable tourism to the community. One such project is the renovation of an old trail between Paterongan and Jici (磯崎). This follows the midsection of a cliff that rounds the Xinji Tunnel (新機隧道), part of the former Provincial Highway 11, and can be reached on foot from next to the more recently completed Xinfeng Tunnel (新豐隧道). Kavalan legend says that there was once a young mother who was carrying her infant on her back as she made her way along the cliff. She did not realize that her child had slipped out of its carrier, falling into the ocean below. She returned to the place of the accident and jumped into the ocean, choosing to perish with her child. Next to this cliff is a rope ladder leading down to the community’s tidal pools. Enjoying a plate of flying fish at a Kavalan home. As the afternoon comes to a close, we once again head up into the coastal hills to Shan Hai Zhi Zhong (山海之仲). This is a mountain retreat run by an Amis and Kavalan couple with fish pond, camping area, and karaoke machine. From here, there are views of the surrounding verdant hillsides and the sea. A large bowl of fish soup and a plate of sashimi are prepared fresh from the day’s catch. All in all a perfect ending to a beautiful day filled with sun, sea, culture and new friendships. “Nngi!” or “Nngi aisu!” is a greeting in Kavalan language. By car: Most of the community’s attractions are located along or off of Provincial Highway 11 between the 41.5 and 46 kilometer markers. By bus: The Hualien Transportation Bus Company (花蓮客運) has three routes (1127, 1140 and 1145) that run between the Hualien train station and the Xinshe Village. View of organic hillside rice terraces and coastal rice terraces.